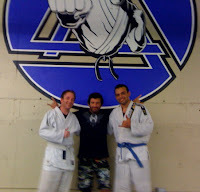 Chris Hoff and I decided to take a night off during RSA and visit a local Brazilian Jiu Jitsu academy. We didn’t know what the place would be like, but Hoff said from the website the cardio looked demanding. Well, let me tell you, they weren’t kidding! My lungs felt like they were going to explode half way through the 30min section. Running, jumping jacks, sprawls, push-ups, bear crawls, and endless supplies of BJJ drills. All the travel is taking a toll on me and seriously need to get in much better shape. Hoff, judging from the fire engine red facial tone, was having a rough time of it as well. Fortunately we made it all the way through the session and got to learn a couple moves. Next came the sparing, but first let me tell you about one of the students. Just after our arrival, a white belt came in and I kid you not, an easy 300+ lbs all nicely packaged in a 5’6” frame. Yes, the size of a small planet. Hoff, also a white belt, immediately catches sees the guy and says, “OH HELL NO!! !”, at the prospect of having to spar with him later. So right when the cardio is over, Chris relegated to the white belt section (I went with the higher belts) and wouldn’t ya know it he gets paired with the big man. AHAHA! :) From what Hoff tells me he had no choice but to pull guard, but his legs wouldn’t have fit around the guys neck, let alone his midsection. Fortunately he was able to make it out unscathed and hold his own for the rest of the night. As for me, I knew I was in trouble right away being exhausted and lacked the ability to even think straight. Not good. I got paired with a 6-year purple belt who was about my size. As soon as we locked horns it was clear this guy was very experienced with the Gi. 1min in he swept me with something I had never seen before (mental note for later), I got mounted instantly and 1min later suffered my first tap. I was not pleased, no way I was going to let that happen again. That thought was short lived. This guy was smooth and I got hit with an arm lock and a choke before the bell rang. I learned I’m not going to be ready for purple from quite some time, gotta keep hitting the gym hard. Fortunately though I was doing well against the next few people I faced. I got tapped some, but returned the favor as well. All the students were very cool guys and made us feel welcome. At the end of class came the battle royal, Grossman vs. Hoff. The room went silent, everyone encircled us to watch, and people started chanting. No not really, no one gave a damn. :) 30sec in, I felt immediately that Hoff had skillz, he definitely isn’t just posing in his east coast academy. The details are a little fuzzy, but I remember landing in side control for a minute or two looking for a way to tap him, but Hoff showed great poise and solid defense. So I figured I’d try something a little fancy, choking him with my own Gi. I took my lapel with my top arm, wrapped it around his neck and proceeded to flip over his body to tighten it up. Hoff’s face was like WTF is this! Very lucky for him he did a great job of off centering me just enough enough to take my back and we started giggling like a couple of little girls. That was fun. Let's make sure we get the place scoped and booked for BlackHat. Xtreme Couture in Vegas!? When you guys are in Austin, you're invited to roll with me at the schools I train at MFS (CTC Austin) and LA Boxing. MMA is also an option. Thanks Phil, next time I'm in time... I'll see if I can drop by.